Step 1: Login to iControlpanel.com <--- or click this link. 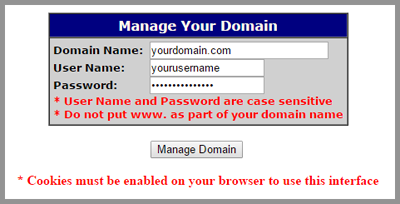 Type your domain, username and password. Step 2: Click Name Servers/DNS -- If you don't see the DNS (next to Name Servers) please submit a ticket and we will enable this for you for no additional charge. If this is greyed out, please click "domain locking" and disable. 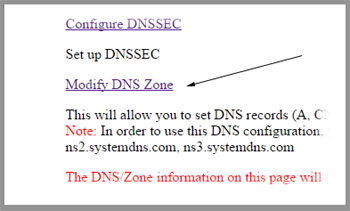 Step 3: Click "Modify DNS Zone"
Step 4: Enter your A records. Scroll down below and you will find fields for CNAME, MX, TXT. 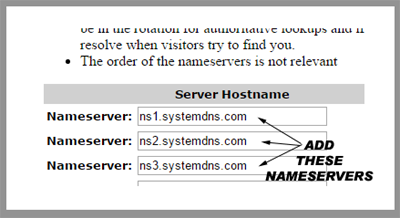 Click "Save DNS Zone"
Step 5: Click "Manage Name Servers"
Step 5: Change your name servers to: Primary: ns1.systemdns.com, Secondary: ns2.systemdns.com, Tertiary: ns3.systemdns.com > Click "Save Configuration"